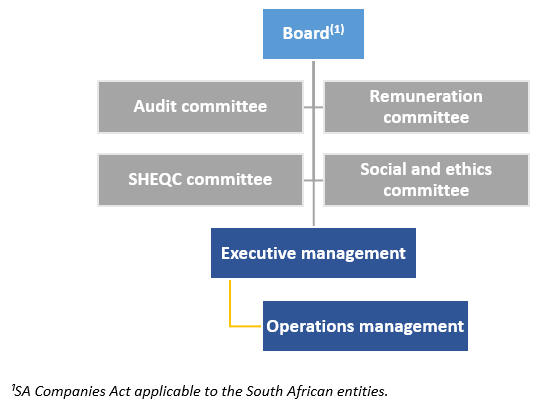 The board is ultimately responsible for the group’s governance structure and framework and is supported by its four sub-committees, as depicted in the framework below. This framework includes a delegation of authority process where the daily management of the group is delegated to the Chief Executive Officer and the group’s Executive Committee (‘Exco’), without abdicating the board’s responsibility. The group’s Exco comprises the Chief Executive Officer, Financial Director and Executive: Operations and HR. Operationally, Exco is supported by the group’s Operations Committee (‘Opsco’), comprising the general managers at all mining operations and key senior corporate office managers. The standards of disclosure relating to corporate governance at the group are regulated by the UK Companies Act, the SA Companies Act(¹), AIM Rules, the JSE Listings Requirements and King IV™. The AIM Rules require the group to adopt and comply with a recognised corporate governance code; the group has adopted the King IV Report on Corporate Governance for South Africa 2016 (“KING IV™”). Pan African Resources has benchmarked its governance practices against the principles of King IV™ and has included its 2018 King IV™ checklist. The board is responsible and accountable for the performance and affairs of the group and has full control over all subsidiaries and operations. It acts as the focal point for, and custodian of, corporate governance. In doing so, it ensures the group remains a responsible corporate citizen, cognisant of the impact its operations may have on the environment and society in which the group operates, while acting in accordance with its own code of conduct. Pan African Resources’ unitary board comprises six directors. The Chairman, Keith Spencer, is an independent non-executive director and the responsibilities of the Chairman and the Chief Executive Officer are separate. Executive directors are the Chief Executive Officer and the Financial Director. Exco and Opsco are invited to attend ad hoc presentations to the board. The Chairman provides independent board leadership and guidance and facilitates suitable deliberation on all matters requiring the board’s attention. He further ensures the board operates efficiently and collectively. The Chief Executive Officer and Financial Director, supported by Exco and Opsco, are accountable for strategy implementation and the day-to-day operational decisions and business activities. Non-executive directors are not involved in the daily operations of the company. A formal board charter is in place to regulate the parameters within which the board operates and to ensure the application of good corporate governance in compliance with the group’s code of conduct. The board satisfied its responsibilities during the year in compliance with its charter. A copy of the board charter is available from the Company Secretary on request. The board ensures the group conducts its business with integrity, leading by example. This commitment is formalised in a code of conduct, which applies beyond the board and includes all employees of the group. The board reflects a balance of executive and non-executive directors, the majority of whom are independent. More importantly, it reflects considerable experience in mining, business and related activities and collectively has a wealth of industry knowledge, adding depth to board discussions. No single director is positioned to exercise unfettered decision-making, which protects against the influence of possible personal interests and ensures that the interests of all stakeholders are represented and considered. Pan African Resources has an audit committee, remuneration committee, SHEQC committee, and a social and ethics committee to assist the board in discharging its collective responsibility of corporate governance. The non-executive directors perform the function and responsibility of the nominations committee. All committees have satisfied their responsibilities during the year in compliance with formal charters. A copy of these charters is available from the Company Secretary on request. The table below details the various key issues discussed during the year under review. Independence is determined through criteria set out in King IV™, which includes an assessment of the individual directors’ character and judgement as well as any relationships or circumstances that could appear to affect their independence. The board also continuously assesses each director’s performance and tenure if it exceeds nine years. Based on this assessment, the board is satisfied that its independent non-executive directors are independent.